MANILA – University of Santo Tomas Golden Tigresses’ Cherry Rondina and Ejiya Laure were leading the way in the Most Valuable Player race after the first round of UAAP Season 81 women’s volleyball. Rondina, who is on her final year with the Tigresses, tallied league-best 17.4 points average in seven matches, second-best 34.26 percent success rate, while at No. 6 in digs with 3.70 excellent digs per set. Laure, on the other hand, leads all rookies and ranked No. 2 in the MVP race with a second-highest scoring average at 16.7 points and a league-best 37.88 percent success rate. 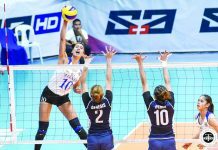 Completing the top five in MVP race were University of the Philippines Lady Maroons’ Diana Carlos, Ateneo de Manila University Lady Eagles’ Kat Tolentino and Ilongga Princess Robles of National University Lady Bulldogs. Rondina, Robles and Laure, meanwhile, emerged as the top three outside hitters with Lady Maroons’ Maria Lina Molde and University of the East Lady Warriors’ Judith Abil at fourth and fifth. Carlos and Tolentino were the top opposite spikers, followed by Far Eastern University Lady Tamaraws’ rookie Lycha Ebon and De La Salle University Lady Spikers newcomer Jolina dela Cruz. Lady Eagles’ Madeleine Madayag leads the middle blocker race with last year’s winner Celine Domingo of Lady Tamaraws at second. Lady Bulldogs rookie Ivy Lacsina came in at third. Among the setters, Lady Spikers’ Michelle Cobb was on top followed by Bacolodnon Arielle Estranero of Lady Maroons, Lady Warriors’ Laiza Bendong and Lady Eagles’ Deanna Wong.